The Tri-State Fertilizer Recommendations for Corn, Soybeans, Wheat and Alfalfa has served as a cornerstone for field crop soil fertility between Michigan, Ohio and Indiana. These recommendations were developed from decades of agronomic field trials across the three states. Although it was a collective scientific work, the extensive data that went into these recommendations were not systematically compiled and shared with the public. This fact sheet reports the field trial data from Ohio that helped shaped the Tri-State Recommendations for phosphorus (P) and potassium (K). At Ohio State, Dr. Jay Johnson was the state soil fertility specialist who co-authored the Tri-State Recommendations. From 1976 to 1999, Dr. Johnson reported the results of his soil fertility field trials from each field season in an annual report. We went through these reports and pulled out every field trial that looked at P and K fertilization (Table 1). We found 68 P trials (site-years) conducted: 38 in corn, 26 in soybeans and four in wheat. We found 92 K trials conducted: 65 in corn, 25 in soybeans and two in wheat. Responsive trials had a statistically significant yield response to fertilizer, while non-responsive trials did not. The phosphorus and potassium trials were conducted at nine total sites. The vast majority of the trials (site-years) were conducted at three sites: Clark County at the Western Branch (41 P trials, 57 K trials); Wayne County at OARDC (15 P trials, 12 K trials); Wood County at the Northwest Branch (eight P trials, seven K trials). 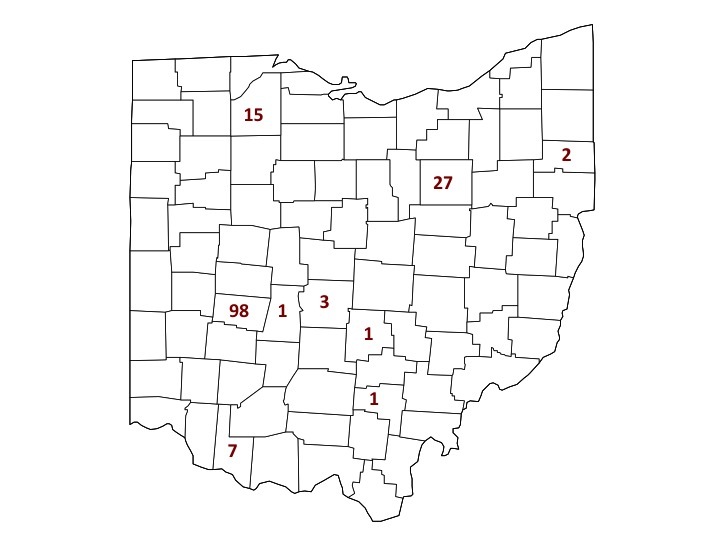 Other phosphorus and potassium trials included Brown County (four P, three K), Franklin County (one P, two K), Madison County (one P, zero K), Mahoning County (zero P, two K), Fairfield County (zero P, one K) and Vinton County (one P, zero K). Figure 1 shows the locations and number of total trials conducted. All trials were replicated with a minimum of three replicates and the vast majority was small-plot trials on Ohio State University research farms. Figure 1. Locations and total number of phosphorus and potassium trials. An important aspect of fertilizer recommendations is knowing when to fertilize. Farmers want to be able to answer the question, “At what soil test level should I apply fertilizer to see a yield response?” To answer this question, we need to establish a critical soil test level. For each trial, we calculated the percentage of relative grain yield by dividing the yield of the unfertilized plots by the yield of the fertilized plots and multiplying the result by 100. We then took the relative yield and graphed it against the soil test P or K level. Figure 2 shows this relationship with P and K. Each dot represents a single field trial (site-year) from one year. The solid black horizontal line at 100 percent represents no change between unfertilized and fertilized plots. The dotted black line at 90 percent shows a 10 percent reduction in yield. The red dashed vertical line shows the Tri-State critical levels of 15 ppm Bray P1 (Figure 2, left panel) and 100 ppm ammonium acetate (AA) K with a CEC of 10 meq per 100 grams (Figure 2, right panel). These graphs show corn, soybean and wheat combined across all sites. We did not find sufficient justification to subset based on crop or site or cation exchange capacity (CEC). Figure 2. Relative grain yield vs. soil test phosphorus (left) and potassium (right). A field with soil test levels to the left of the red dashed line has a reasonable chance of a yield response to fertilization and so fertilizer is recommended, while fields with soil test levels higher than the red line have a very low chance of a yield response to fertilizer, and so little to no fertilizer is recommended. The black dots are field trials that were not responsive to fertilizer. In other words, fertilizer did not statistically increase the yields for that trial. Grey dots show responsive sites, or trials where fertilization caused a statistically significant yield increase. All of the responsive sites for phosphorus were below 15 ppm Bray P1 (left of red line), and all but one of the responsive sites for potassium were below 100 ppm AA (Figure 2). Black dots below the critical level (to the left of the red vertical line) show that yield responses often do not occur, even with low testing soils, as phosphorus or potassium may not be the most limiting nutrient or resource for any given year. These field trial data collected over nearly 25 years from Ohio, indicate the established critical levels of 15 ppm Bray P1 and 100 ppm AA were justified. To answer this, we took the responsive sites only from Figure 2 and graphed the maximum fertilizer rate applied where a response was observed versus the soil test level. Figure 3 shows this relationship for phosphorus (upper graphs) and potassium (lower graphs) for corn and soybean over all sites. Wheat was omitted, as there were too few trials to be meaningful. These graphs show that when soil test phosphorus and potassium levels are very low, crops will respond to high rates of fertilizer (150 pounds per acre of P2O5 and 200 pounds per acre of K2O). But as soil test levels increase and approach the critical level, crops no longer need large rates of fertilizer. In other words, large levels of applied fertilizer will not produce greater yields than a small amount of fertilizer. This justifies the philosophy that very low soil test levels require high fertilizer rates, but as soil test levels increase, our fertilizer rates decrease. Figure 3. 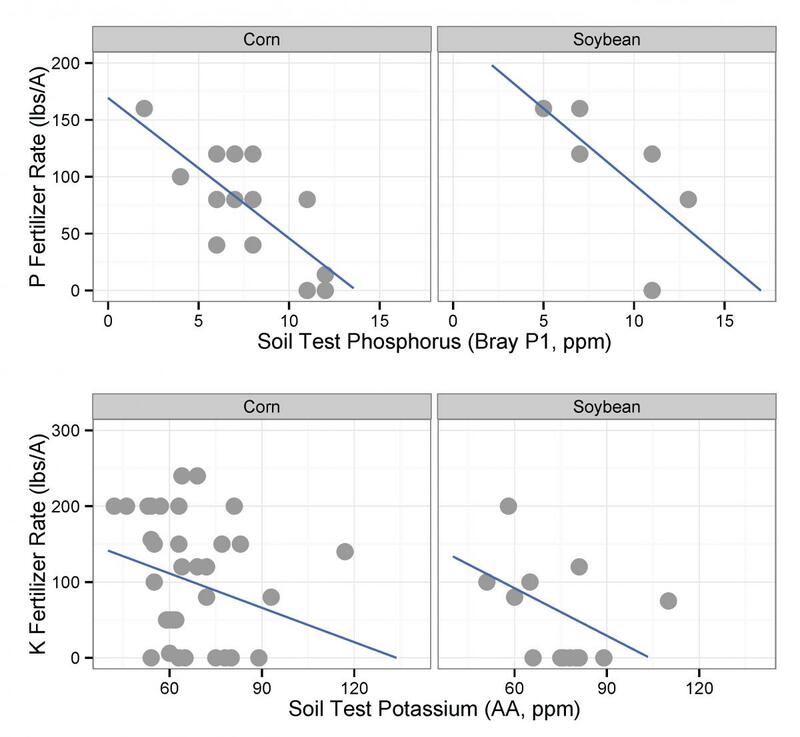 Maximum fertilizer rates that were responsive versus soil test levels for phosphorus (upper graphs) and potassium (lower graphs) for corn and soybean. The Tri-State Fertilizer Recommendations provided a unified soil fertility framework between Michigan, Ohio and Indiana. Here, we’ve compiled, analyzed and shared the phosphorus and potassium field trial data from Ohio collected under the supervision of Dr. Jay Johnson. The 25 years of fertility trials were conducted at a limited number of sites, but conducted across a range of tillage practices and pH ranges within those sites. These data showed 1) the very low probability of yield responses above 15 ppm Bray P1 and 100 ppm AA for corn and soybean, 2) applying higher fertilizer rates at very low testing soils was a justified approach. These historic trials helped inform farmers when to apply fertilizer and how much to apply. However, as production practices have changed, it is justified to question recommendations published over 20 years ago. Future research should demonstrate if these historical trends hold true, or if fertilizer management should change to meet the needs of contemporary field cropping systems. Vitosh, M.L., J.W. Johnson, and D.B. Mengel. 1995. Tri-State Fertilizer Recommendations for Corn, Soybeans, Wheat, and Alfalfa. Extension Bulletin E-2567.